David Edwards – The World’s Premier Golf Trick Entertainer and After-Dinner Speaker. The David Edwards Trick Golf Show is fantatsic golf entertainment. He has undoubtedly become one of the most popular ‘Trick Shot’ performers on the world’s stage. David Edwards has an outstanding golfing pedigree and is a former European Tour player. His tournament career spanned 30 years and took him to all the top European events. His skills as a professional leaves you in know doubt that his incredible talent for difficult and spectacular shots will inspire his audience. A natural communicator and showman, with the gift of non-stop wit and repartee, David is able to thrill, amuse and involve his audience, keeping them captivated throughout the show. Using his incredible powers of concentration and the most unlikely props, such as claw hammers, hosepipes, fishing rods and many more, his fantastic feats of skill, timing and judgement are breathtaking. “The main aim of the show is to demonstrate rhythm and control” says Edwards.” I am sure many golfers go away having learned from watching the concentration I put into each shot”. From his famous two-handed ‘Edward Scissor Hands’ shots and new ‘moving ball’ drives… to dispatching a ball from a tee held in the mouth of a willing member of the audience lying on the ground… his accuracy is astounding. David Edwards performs worldwide. This year alone as well as many engagements the length and breadth of the UK, he has visited Denmark, Turkey, Brazil, Germany and the 2007 Volvo China Open at Shanghai Golf Club. He has performed on some of the grandest stages of all; amongst these are Golf Expo 1999 and 2000, the Millennium Open Championship, on board the QE2 at St Andrews, and the World Corporate Golf Challenge in La Manga. The show is unique and can be tailored to suit any event. A popular feature is ‘on course’ video coverage of guests. David records the varying performances of the guests and plays them back at the end of the day with a voice-over steeped in his dry sense of humour. David makes sure he knows the name of every player and captures them in action on film accompanied by some of his own inimitable on-course commentary! It provides some great entertainment at the end of a Corporate day, a Society day or even a captain’s day. "Prepare to be amazed, David's show is highly skilled, very professional, and most enjoyable. This display of brilliance would 'make' any corporate or private event"
"There is a small band of golf professionals who have the consummate ability being able to demonstrate a variety of trick shots with great skill and aplomb. During my life in the world of golf I've seen most of them and David Edwards ranks alongside the very best. 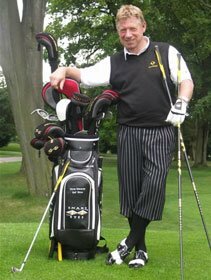 Amusing and informative, his skills will enhance any golf day." "The Trick Golf Show was absolutely amazing and the feedback from all of our members and guests was exceptionally positive."